The famous Mollard baton is exceptionally well balanced and comfortable. We are pleased to have introduced Mollard's hand-turned aluminum handle baton in anodized gold, silver or black. They have a carbon fiber shaft an are available in 12" (305mm), 14" (355mm) or 16" (405mm), the baton overall length shown includes handle. Please scroll down to view more information on this item and to learn about our custom engravings. PLEASE NOTE: During the gold anodizing process, slight color variations occur and the color of each gold handle may vary slightly, even within the same order. 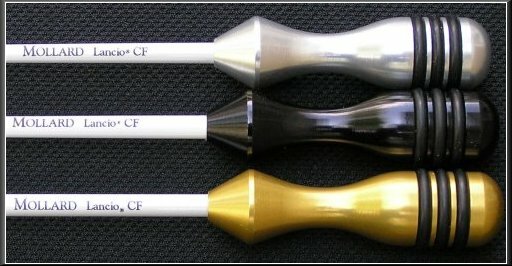 Additionally, the color your computer monitor displays for these images of gold, silver and black batons may be slightly different from the color you receive. NEW; Mollard Baton shafts can now be engraved with your name, or the name of your gift recipient on the shaft of the baton of your choice. The cost is $22.50 per baton for a name (example: John Doe or John David Doe). When you add to cart you may enter your exact engraving in the text box provided. Should you desire a longer phrase, we will contact you if there is an additional charge. SORRY WE CANNOT EXPEDITE ENGRAVING ON SHAFTS. Please allow an extra 7 business days to accomplish this.